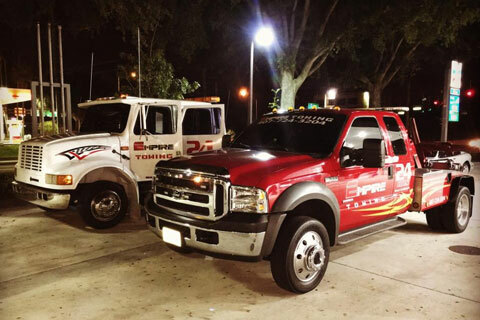 Orlando towing service, Empire Towing, is a family owned business, specializing in towing, repo recovery, and wreckage removal. We also buy junk cars, remove illegally parked vehicles, and offer roadside assistance. We help Orlando property owners and HOAs with vehicle removal and can even tow all wheel drive vehicles, motorcycles, and ATVs. In addition to towing services, we also offer boat transport, exotic car transport, and heavy equipment transport services. Need a tow in Orlando? Call Empire Towing Services and we will assist you with a fast and secure service. We are available 24 hours a day, seven days a week. Empire Towing guarantees quality service at a reasonable price. At Empire Towing, we are your repossession recovery specialists. We have a fleet of tow trucks ready to go at a moment's notice and can repossess vehicles of all shapes and sizes. Call today for more information. Got an old vehicle that needs to go to a storage yard but can't make it there under its own power? No problem! Our fleet of tow trucks gives us the ability to tow just about any size vehicle anywhere we need to. We have a full service body shop and collision center. Not only can we tow your vehicle from an accident scene; we can also fix any body work issues resulting from the crash. Our collision center deals with all major insurance companies. Car break down? Not sure what's wrong with it? Need mechanical assistance? Don;t worry! At Empire Towing, we have full time mechanics on staff who can inspect your vehicle, diagnose problems, and help you get back on the road. Got an old junk car taking up space in your driveway? Call Empire Towing Services today! We buy junk cars, running or not. Taking that old junker to the scrapyard is a hassle. Let us take it off your hands and save you the headaches. No one plans to find themselves in a situation where they need a tow truck, but it happens to everyone. These can be very stressful situations and dealing with an unprofessional and uncurteous tow truck operator can only make matters worse. To add insult to injury, there are a lot of towing companies out there who will try to take advantage of people in a desperate situation. That's why at Empire Towing we specialize in providing the highest level of professional and courteous towing services at a competitive price 100% of the time. We treat all our customers with respect and dignity and never engage in price gouging. Our guarantee is that you will receive the highest quality towing, wreckage removal, and vehicle recovery service at a price you can afford. If you are ever less than 100% satisfied with the service you received from one of our tow truck drivers, please do not hesitate to call us. We will do everything in our power to make sure that your experience with Empire Towing Services was a positive one. Fast and friendly services; that's the Empire Towing Guarantee! Out of gas? Battery need a boost? Vehicle won't start? Were you involved in an auto accident and need a tow? We've got you covered! Empire Towing specializes in towing, wreckage removal, and helping stranded motorists . The wide variety of services we offer makes us your best choice for towing, wreckage removal, and vehicle removal and recovery services in Central Florida. Our coverage area includes all of Orange and Seminole counties, including Orlando, Casselberry, Longwood, Sanford, Lake Mary, Altamonte, Maitland, Winter Park, and Winter Springs. People often decide where to park based on what's convenient rather than what's allowed. If you own or run a business center, apartments, condos, or homes, you've likely had issues with people parking illegally on your property. If you need help removing illegally parked vehicles from your property, call Empire Towing Services today. Specializing in helping businesses and HOAs with vehicle removal services. We are Central Florida's property vehicle removal specialists!